Several weeks ago I tried a new restaurant in my neighborhood that supposedly had an extensive beer selection and a decent menu to match it. Much to my surprise, there was a variety of food from burgers and sandwiches to jambalaya to sweet potato tots. With the server’s suggestion, I ordered the Philly cheesesteak that had an Argentinian twist. At first bite, the sandwich was very tasty; the flavors from the sauteed onions and mushrooms, thinly sliced beef and chimichurri aioli all balanced each other very well. However, the more bites I took, the greasier and greasier the sandwich became. Yes, I am aware that Philly cheesesteaks are supposed to be greasy, but I like to enjoy my food without feeling a rim of oil around my lips. 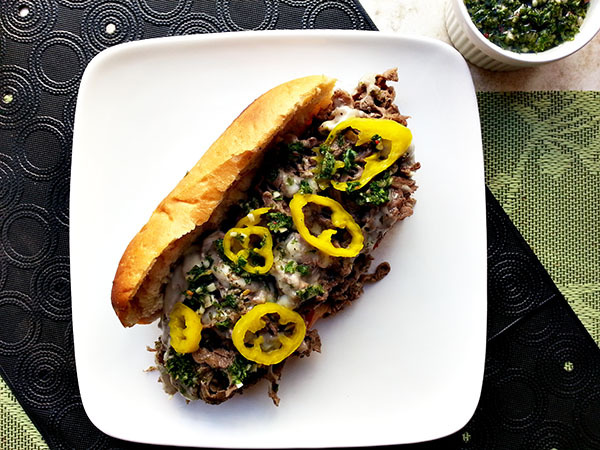 This recipe is my approach at a somewhat healthier version of an Argentinian Philly cheesesteak that doesn’t sacrifice any of the taste. Combine the thinly sliced rib eye with the garlic, salt and pepper, and olive oil, making sure to coat the beef evenly. Cover and refrigerate overnight in the refrigerator. Make the chimichurri. Finely chop the parsley and combine with the garlic - salt and pepper in a medium bowl. Stir and let sit for at least 1 hour to let the flavors develop. Heat 1 tsp oil in a saute pan or cast iron pan over high heat. Add the marinated beef and let brown before flipping over, about 5 minutes. Add 2 tbsp chimichurri to the beef and stir to combine. 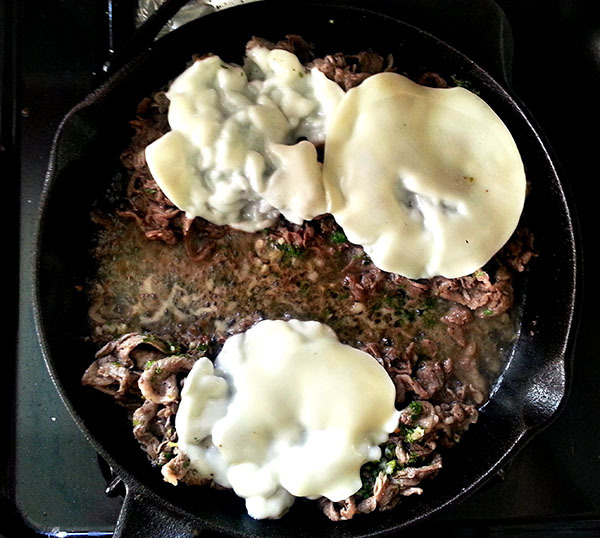 Lay 4 slices of provolone on top of the cooked beef. Let the cheese melt, about 1 minute. Remove beef from heat. Assemble sandwiches by laying slices of tomato on the bottom of the rolls. Top with the ribeye and melted cheese, drizzling more chimichurri on top. Finish with the banana pepper and top roll. Serve immediately. Everyone knows that Philly cheesesteaks originated from Philadelphia, but did you know that it was created by two men who owned and operated a hot dog stand? The original Philly cheesesteak was actually just a steak sandwich, no cheese included. Sliced provolone cheese wasn’t added to the sandwich until several years later. 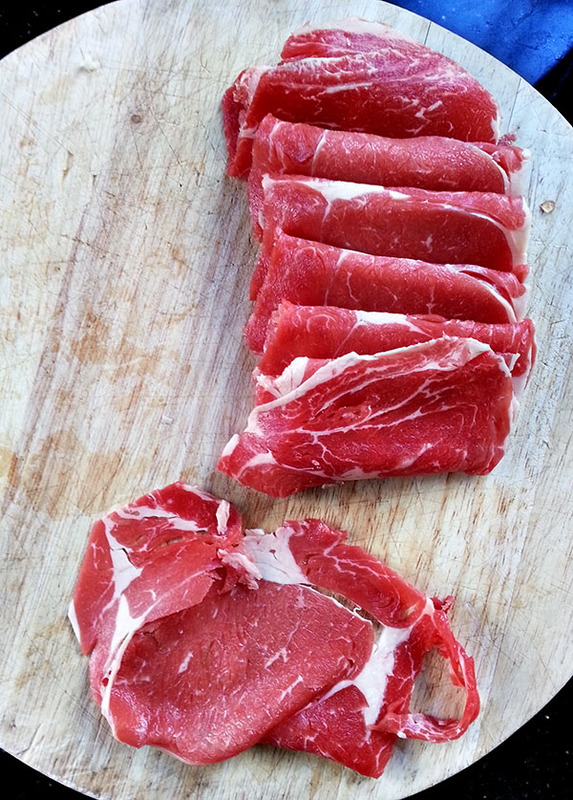 Traditionally, thinly sliced ribeye or top round is used for the steak and cheese sandwiches. You can ask your butcher to prepare the meat for you in order to get the beef paper-thin. When cooking the ribeye, make sure the pan is smoking hot before adding the meat. By doing so, you will allow the outside of the meat to cook as soon as it hits the pan, creating a “crust” on the beef. As for the cheese, provolone or American cheese are usually the top contenders but there are many restaurants who serve the sandwich with cheez wiz. I personally can’t imagine making a sandwich with cheez whiz, so I stuck with provolone. Although tomatoes are not found in Philly cheesesteaks, the freshness of the tomatoes helps cut the fattiness of the sandwich. 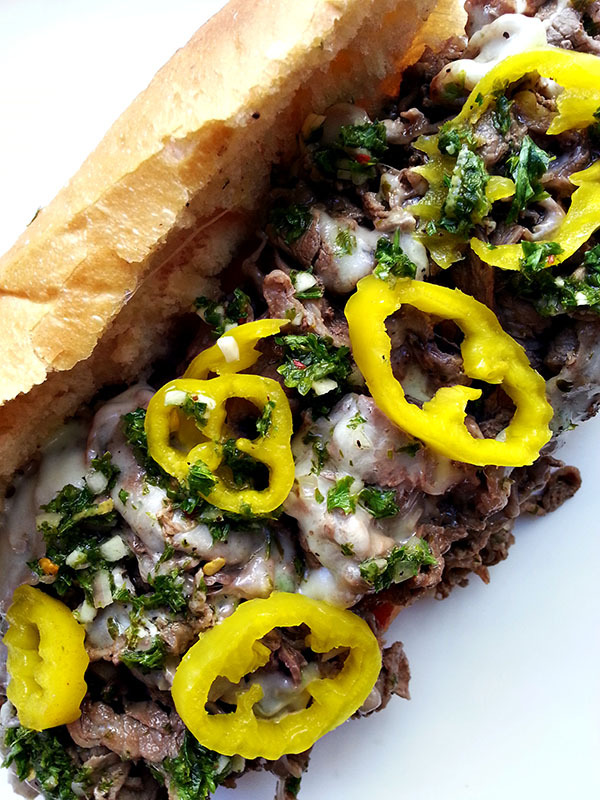 Drizzle extra chimichurri on the ribeye, top with banana peppers and serve on a toasted hoagie. This sandwich was beyond words, perhaps even better than the restaurant’s cheesesteak. 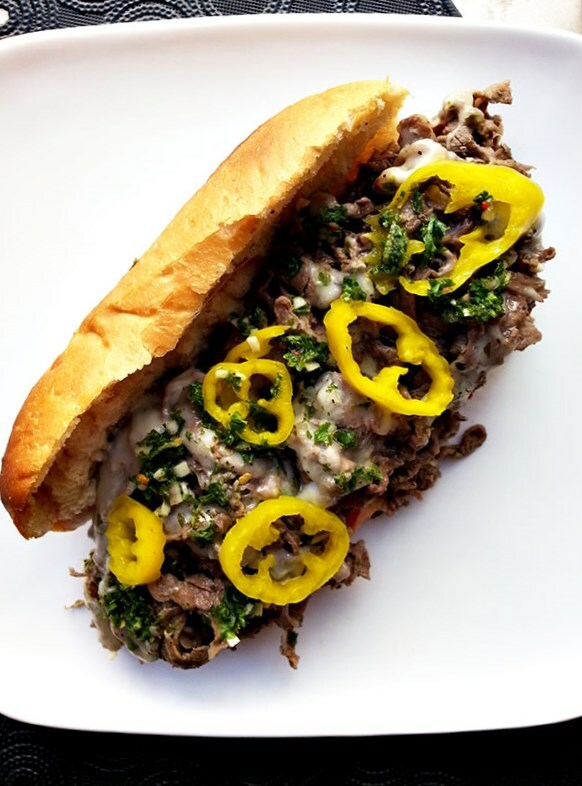 All of the flavors are mild from the provolone to the lightly seasoned beef to the slightly tart chimichurri, allowing all of the flavors to shine. None of the ingredients are competing with one another, rather they are working together to create one solid sandwich. 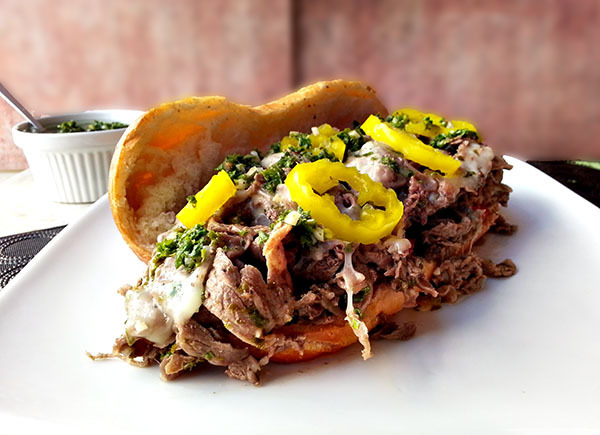 This is not a traditional cheesesteak, but this is one great variation of the classic sandwich.